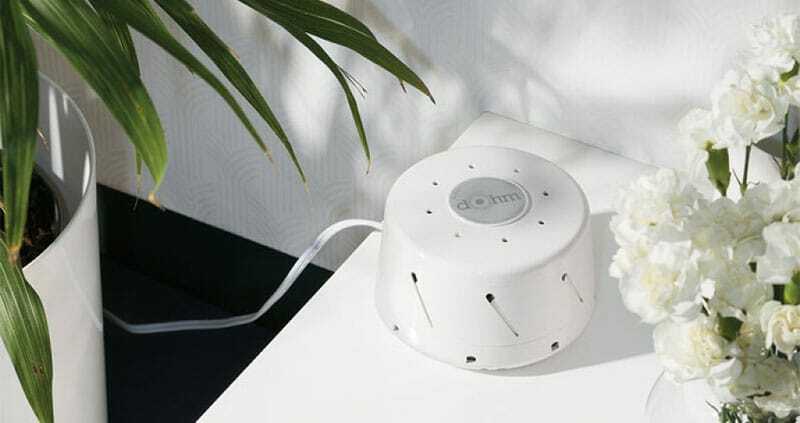 Whether trying to meditate, sleep or just drown out the annoying noise of the neighbors or your coworkers, sound machines are a great addition to your life. 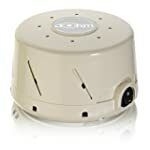 Some people call them white noise machines, others call them sound therapy machines, some call them noise cancelling machines, but I prefer to just call them sleep sound machines. The truth is that there is a lot of variety when it comes to these little gadgets. Some only give you white noise, while others have an assortment of sounds for you to choose from such as ocean waves or summer rain on a tin roof. Where and When Can You Use Sound Machines? If you are completely new to these gadgets, then you might be wondering if you really need one in the first place. The truth is that they offer a lot of benefit if you need to block out some unwanted noise or if you just want to create a specific noise environment for something like meditation or writing on your novel. Babies find them especially soothing for sleeping, which is why a lot of new parents using sound machines for babies. With so many ways to use these, there are really a lot of different situations and conditions when you might want to use one. Personally, I find noise cancelling machines for sleeping to be a must-have. In fact, I have a little travel sound conditioner that I take with me everywhere I go so that it is easier for me to sleep in hotel rooms. I also have an app for it on my phone that I use on long airplane or train rides. Offices can be a place of distracting noise, and if you need help focusing then one of these can help. Lots of professionals look into noise cancelling machines for the office as a way to help that focus. Some doctors, such as therapists, like to use these in the waiting room so that there is no chance of confidentiality being broken by someone overhearing something that they shouldn’t be hearing. Some businesses, like yoga studios, use sound therapy machines to help create a certain mood for class attendees. There are even some models that will release an essential oil at the same time as the sounds, which you often see in places like yoga studios and day spas. 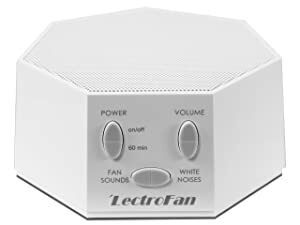 I also know a writer who uses one of these sound conditioners in her office to prevent outside noise from distracting her while she works on that next masterpiece. 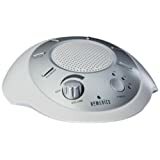 If you have trouble winding down at night for sleeping, then one of the sound therapy models might be the perfect solution for relaxing your body. It is possible that sounds like the crashing waves of the ocean or a gentle rain storm is just the signal that your brain needs to relax. As I’m sure you can tell, I actually have quite a bit of experience with these little gadgets. I have tried out several different brands and models over the past few years. These days, I keep more than one in my home as I use them for different purposes and situations. With that in mind, I want to share some of my favorite models with you, in case you are shopping for one and need some help comparing them. 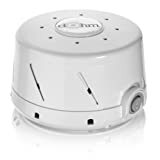 If you want something that is just very basic without any extra sounds or features, then this Marpac DOHM-DS sound machine is a really solid choice. It’s been on the market for years and continues to be one of the best options for the money. It is available three different colors – tan (pictured), black and white. So, you can choose the one that best matches the decor of the room that you will be using it in. I know that it looks kind of big in the picture, but it is not. In fact, it’s only about 3-inches high and maybe 6-inches wide – so small enough that it won’t take up much space or be an eye sore in the room where you use it. This product is Made in the USA, if that is important to you. It is a very high quality item that you can expect to last you for several years, less you bang it around or something. Though it does seem pretty durable as I’ve traveled with it a few times and it still works like new for me. 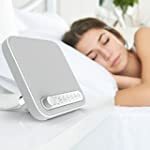 Also known as the Marpac Sound Screen & SleepMate 980, this little thing only has one sound for you – straight up white noise. There is a volume control, but that is really the only variety that you get. It is a good choice for: babies, apartments, dorms, daycares, offices, and hotels. With it being white noise, you don’t have to worry about any annoying sound loops, which is nice. If you’ve ever used a cheap sound machine then you already know just how terrible sound loops can be. 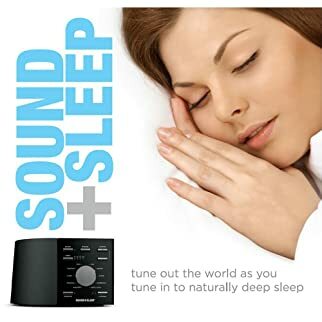 One cool thing that I’ve learned about this one is that it is the official sound conditioner of the National Sleep Foundation – so that’s pretty interesting. If they trust it for helping you sleep, then no wonder it is so popular with people everywhere! 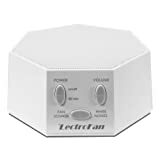 So, I’ve owned three of this exact sound therapy machine. Why so many? Because it never seems to last very long before a static sound take over all the sound options. 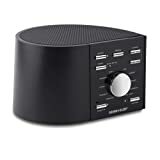 If you’re wondering why I kept buying the same one when this kept happing, it is because this is a very cheap sound therapy machine. 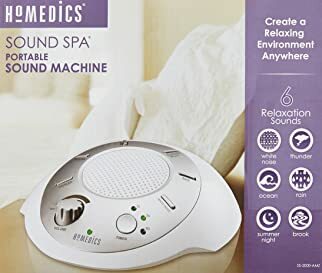 HoMedics has a great reputation when it comes to making things like this, but I honestly had the exact same problem with all three of these that I owned. But for the money, it was still a decent buy since I’d get one to two years out of each one before it had to be replaced. Personally, I love their rain sound, which is why I kept buying these ones! It’s a really awesome sounding little rain shower that makes it so easy for me to sleep! This one can run on a battery or the electrical outlet, which is nice since it will still work if the power is out. It also has a timer on it if you’re using it for naps or something like that. I’ve also traveled with one of these in the past and the small size makes it real easy to fit into a carry on suitcase. For the price, honestly, this one is a good choice if you can’t afford to spend any more. In my experience, you can get at least a year’s use out of it before the possibility of static interrupts your calming sounds. This one right here is actually one of my favorites that I’ve used so far. I love that it has this nice sleek look and design to it. And it offers a nice variety of sounds, with some options that I’ve yet to find on other models out there. You get a total of 10 different sound options on this one. And I never notice a sound loop on it. But what is really neat about this one is that the sound level changes according to your environment, which makes it perfect for sleeping. You see, it has Adaptive Sound technology, which means that it is automatically adjusting to detected background noise for uninterrupted peace and relaxation. pretty cool, eh? 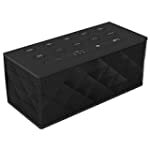 You can actually hear a sample of each sound on the product’s Amazon page. Bottom line: I’ve had one of these for a while and love using it for sleeping. It is one of the higher end options though, so it is not an ideal choice for everyone out there. This one comes in either white or black and is a good alternative to the Marpac model listed up above. In all honestly, they are a lot alike since they are white noise machines. The difference between this and the Marpac is that you get 10 different fan sounds and 10 different white noise sounds. So that variety is what sets it apart from the Marpac. This one is also smaller in size than the Marpac listed up above, which can be important if you don’t have a lot of space or want to take this in your suitcase when you travel. What’s interesting about this one is that it is powered by USB connection. So, you either connect it to the power cord for your electrical outlet or you connect it to your computer to power it. This makes me think that it was designed for use in offices, but I don’t know that for certain. This one also has a timer on it, which is good for meditation and naps. Personally, I never use the timer feature but I definitely understand it’s appeal. Overall, I do think that this one is a slightly better choice than the Marpac due to the smaller size and more sound options. However, compare them both yourself to see if you agree with me.